Wader Quest: Good news for Thai Spoonies, but it doesn't stop there. Good news for Thai Spoonies, but it doesn't stop there. We have learned that a single generous donor has given sufficient funds to meet the immediate financial need of the Bird Conservation Society of Thailand's (BCST) appeal. "BCST would really like to thank all donors for the support! It’s been a very exciting week for us since we first launched the campaign. We are pleased to announce that we have finally reached our first target of 10,000 USD. This amount of donation will enable us to secure and manage the land of approximately 6 hectares at Pak Thale for 1 year. Our next steps will be to start renting the land andworking closely with the local community to establish a site management plan that leads towards sustainable land use that both benefit migratory shorebirds and the people. However, your continued support is still needed in order for us to extend our work at Pak Thale into the following years. Eventually, we plan to shift our target from renting to buying the land. We would also like to thank Wader Quest for helping us promote our campaign at the recent UK Birdfair as well as through their website and contacts. We look forward to more cooperation in the near future. To be part of the support for the conservation of Spoon-billed Sandpiper and other migratory shorebirds in the Inner Gulf of Thailand, please visit the following page >>http://www.bcst.or.th/?page_id=4755&lang=en"
There is a lot of work to do, this first step is important but it is not the end, to paraphrase our good old friend Sir Winston Churchill once again; this is not the end, nor is it the beginning of the end, it is perhaps the end of the beginning. Wader Quest is proud to have been a part of raising the profile and promulgating this important project for not just the Spoonies but all migrant waders that use the salt pans at Pak Thale and hopes to remain a constant supporter whilst at the same time continuing to assist other projects around the world. To those of you who have already donated to Wader Quest in support of this fund, thank you, the money is still essential and to those who were thinking of doing so, please still do so as there will always be a threat to the Spoonies in Pak Thale until the land is owned by those who care. 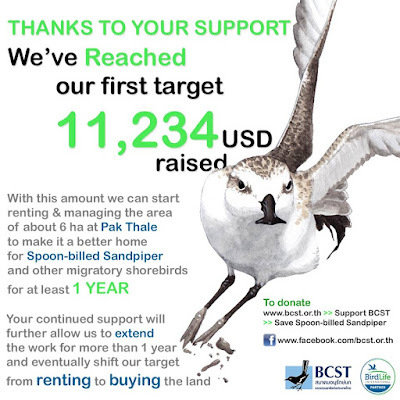 Donate to this project through Wader Quest using the SUPPORT THE THAI SPOON-BILLED SANDPIPER SALT PAN APPEAL HERE button top right of side bar. So, if you care as we do, then help us to support them.